This Canon EOS 2000D / Rebel T7 user guide is a Great Manual, with 4 hours of exclusive training videos! This book is a superb manual for anyone who wants to get the best out of their Canon Eos 2000D | Rebel T7. Ideal for anyone who has just bought their first DSLR, it covers the basics really well, explaining each button and setting in detail. Then it explains how to use the settings so that you can produce beautiful professional-level photography. The author, Jeremy Bayston, has been a picture editor for national newspapers for over 25 years and brings a wealth of experience to this manual. He has produced 13 specially made, exclusive videos, which go into greater detail on effects, menus, modes, shooting videos, getting the best sound for movies, and much more. This manual • Has 13 exclusive videos about the Modes, Tabs, Autofocus, Filters, Flash and more • Helps you get a great feel for the camera, exploring the shooting modes, and effects • Explains the settings to get better results from exposure, lighting and focus • Tips and tricks, to help you master focusing, metering and flash • Includes 20 pages on shooting video, with a whole chapter on sound • Chapters on shooting better portraits, action shots, reportage and landscapes. The brilliant tips and tricks on metering, focusing, how to use the flash and how to shoot great movies have come from years of working with some of the best photographers in the industry. There are chapters on best equipment, lenses and setting up studio lights. He has also included chapters on shooting portraits, landscapes, action and reportage photography, again with great advice and tips. And for anyone who wants to use the Canon Eos 2000D | Rebel T7 to shoot movies - it is a great video camera - the are chapters on video basics and how to get the best sound, and much more. Although quite compact, this is a very accessible manual, telling you all you need to know to get started with the Canon Eos 2000D | Rebel T7. Then it shows you how to take great pictures and videos with this Canon DSLR camera. For more experienced photographers, this guide explains the advanced functions so that you can quickly get started. It also explains the camera controls, and guides you through all the Menu Tabs and Custom Settings to help you best set up the camera for your specific shooting needs. The videos explain things in more detail and if you have any problems, you can contact the author via the the thriving Youtube community (25,000 subscribers) on the Camerawize channel. With this manual, you get the perfect blend of photography instruction and camera reference that will take your images to the next level. 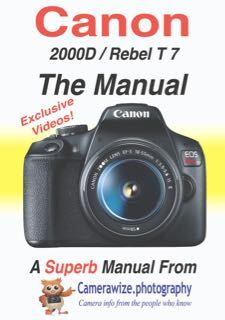 If you have a Canon Eos 2000D | Rebel T7, you owe it to yourself to get this manual! Contents include: Getting to know your 2000D: Exploring the Canon Eos 2000D - This chapter explains every button, dial, and indicator on your camera. Where to Start: Walks you through setting up your camera for immediate use. The Buttons in detail: This chapter teaches you how each of the EOS 2000D’s modes functions and effects can help you produce excellent results. Tips and tricks: Explaining focusing, metering, flash in detail. Lenses: A chapter on the best lenses to use for stills and video. Flashguns and studio lights: What to look for in Flashguns and studio lights and how to set up a studio. Portrait, Action, Reportage and Landscape photography: A chapter on each, explaining how to use the Canon EOS 2000D to get the best possible pictures. This SUPERB manual can help you progress you from absolute beginner to accomplished DSLR photographer!